Oklahoma Connection | Troy came as a missionary and teacher to Native Americans in 1884. Sister Mary Frances Troy was one of only five pioneer Sisters who came to Oklahoma in covered wagons to convert and teach the Native Americans. 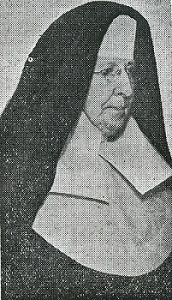 Sister Mary Frances Troy was born Margaret Ann Troy in Michigan in 1862 and entered the Sisters of Mercy in Illinois in 1883. She attended college at Creighton University in Nebraska before coming to Oklahoma Territory as a missionary and teacher to Native Americans across the area in 1884. She later joined the staff of Mount Saint Mary’s High School in Oklahoma City. It was here that her powerful educational, mission-minded commitment and dedication to young people proved to be among her most lasting legacies.